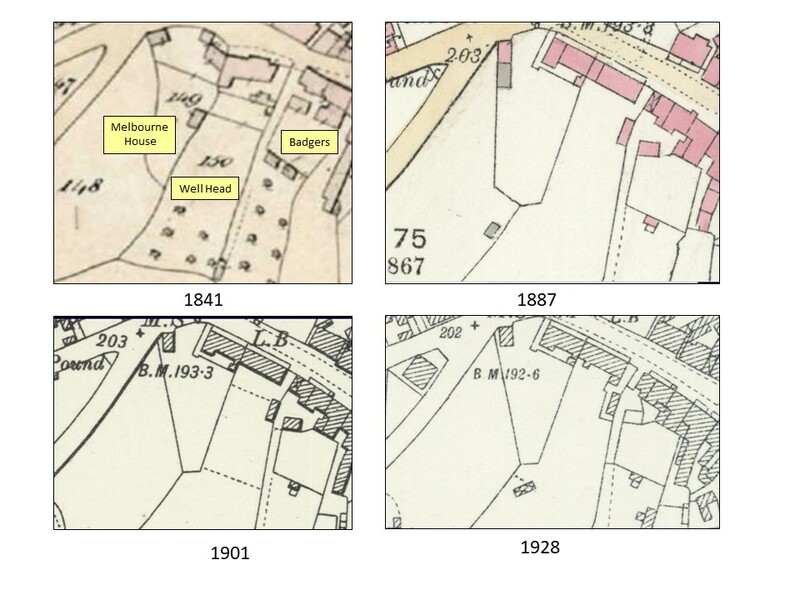 The earlist view so far found of Well Head House from 1870. 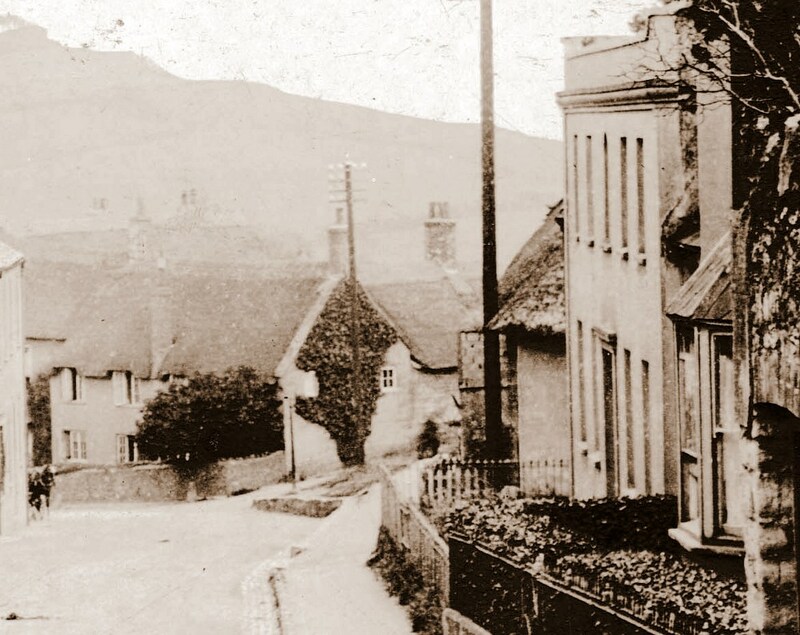 It shows Claremont with its look out window dating back to when it was a Toll House for the Turn Pike Road linking Charmouth with Bridport and Axminster. The next House, now known as Badgers was originally the Farm House for Foxley Farm that covered a number of fields behind it. Well Head House is the five bay georgian property with thatched buildings on either side which have since been incorporated into the house. Finally "Melbourne House" is seen at the corner of Old Lyme Hill. There are few close up photographs of Bruton House ( now Well Head House). This is the nearest you can get to how it once looked before being dramatically altered. This dates from 1895. A nostalgic photograph of the occupiers in the garden at the rear of Well Head House at the end of the 19th century. 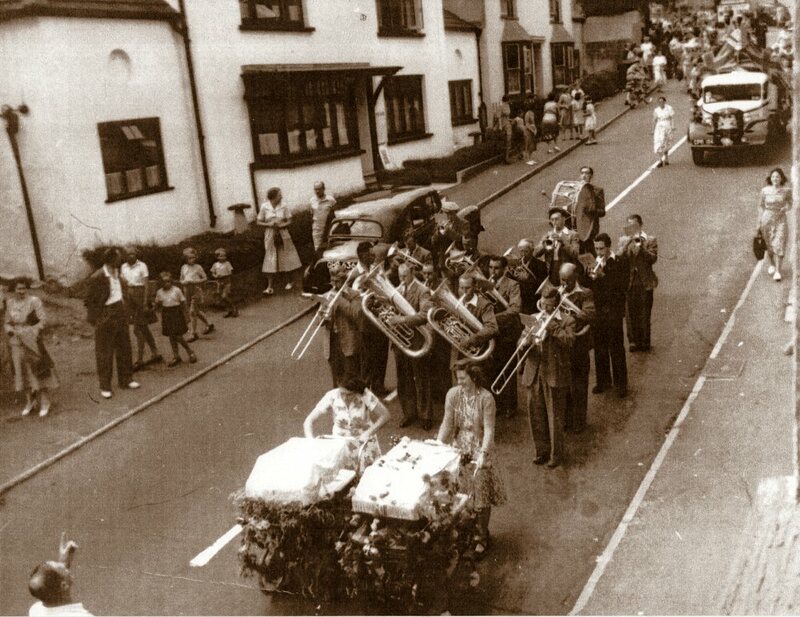 Well Head House is seen here on the left of this photograph of a procession marching down the Street in 1953. The Well Head", the next house down, is an old Jacobean cottage. Originally it had two rooms downstairs, about 12 ft. by 12 ft. and two bedrooms upstairs. The outside walls were between two and three feet thick built of large beach stones. At some later period a lean-to room was added on the south and the space between the cottage and that above roofed over. It was thatched and the original tree rafters can be seen in the attic. During the latter part of the nineteenth century Reuben Durrant lived here and farmed Foxley. One of the front rooms the kitchen and the lean-to the dairy. The stable between the two houses. A fellow of Magdalene College Oxford, C .R. L. Fletcher used to lodge here for the summer holidays and one year Cosmo Lang, then Vicar of St. Mary's, Oxford, came with him. He preached in Charmouth Church on one occasion and the congregation settled down to sleep as was their custom. Gradually one person and then another sat up and took notice at what was being said. Fletcher used to tell this story and always spoke of Lang as the future Archbishop of Canterbury, a prophecy which of course came true. The Fletchers were the first people to have bathing tents on the beach, thereby ending the custom of the men going beyond the mouth of the river to bathe and the ladies using the bathing machines. There was no garden or railings in front of the house and it is difficult to judge how much garden Reuben cultivated. At the top was a gateway into his fields, which now does not exist. Early in this century the house was considerably altered. The kitchen had a large window thrown out and became the dining room. The dairy then was turned into a kitchen and a small scullery added. The drawing room was enlarged by an addition of a large window facing the garden. Then was converted into a passable sitting room, with an entrance from the drawing room. In making alterations it was discovered how thick the walls were and the great size of the beach stones. The house looks larger than it is, there are only two good bedrooms and a dressing room. An attic runs the whole length of the house .The Well Head called Bruton House until 1928 Mrs. Snowden lives at one time, she was the wife of a coastguard and lived in the Excise houses opposite the Mill until her husbands death. Captain Grant of Langmoor came to live with Mrs Snowdon and died there. He was buried with full naval honours by the coast guards and was buried in the churchyard.they used to be a large stone anchor on his grave." With the help of Reg. 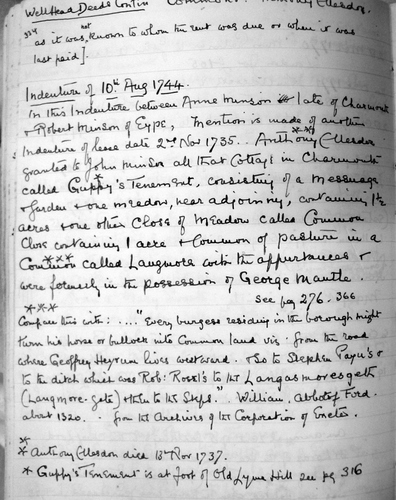 Paveys notes and the Land Tax lists I have been able to pinpoint where Lieutenant James Warden lived before purchasing the Manor of Charmouth and associated properties in 1788. They show that in 1781 he was renting a house from John Adcock. He may well have taken on the fine house before this year, as this is the earliest year that we have. 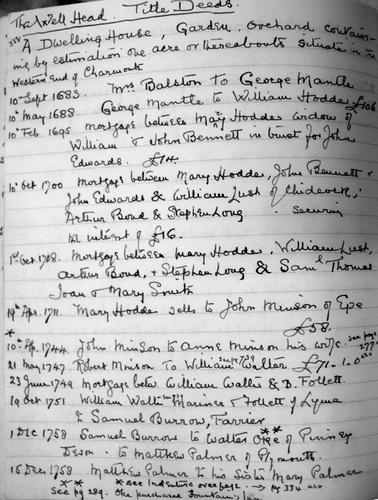 For it was in 1779 that James married Elizabeth Newell Puddicombe Crowcher who was at that time living in Chideock. Both were widowed and comfortably off and chose no doubt to move to the next village, where Elizabeth’s family owned Wood Farm. John Adcock had originally come from London and had paid £105 to a Miss Palmer for the house. 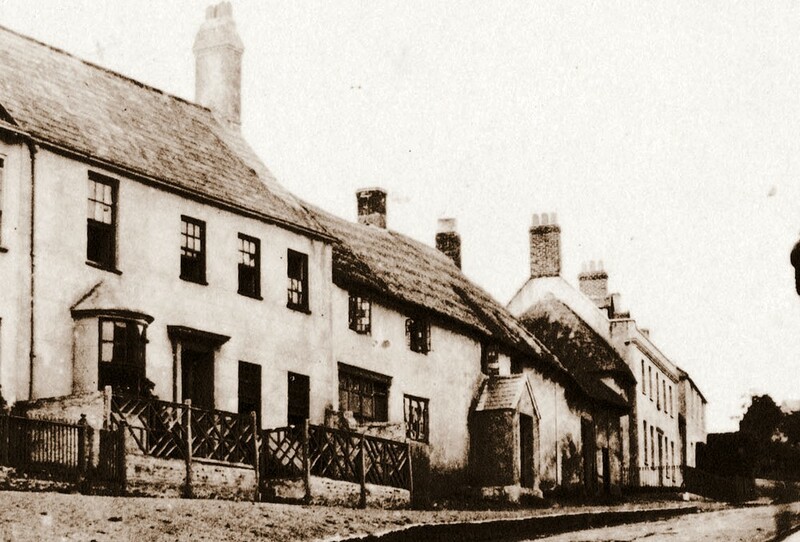 James Warden and his new wife Elizabeth were to continue to live in the village until 1788, when he came into a sizeable inheritance from his Aunt - Hannah Parkes and would go on to buy the Manor of Charmouth. He sold all the lands to the north of The Street to Rev. Brian Coombes, Rector of the village, which was renamed Backlands Farm and kept those to the south which was renamed Seaside Farm. He was to live in the Old Manor opposite the church but had plans for a more impressive house and began building a manor house at Langmoor. Unfortunately he was to fall out with a neighbour over his dog and ended up being killed ina Duel. When finished, Lanmoor manor was rented out by his widow and she continued to live in the Manor. On her death in 1796, it was sold and her daughter, Ann, was to rent Langmoor Manor for much of her life and live in Melbourne House, next to The Well Head with her unmarried daughters, who continued there after her death. 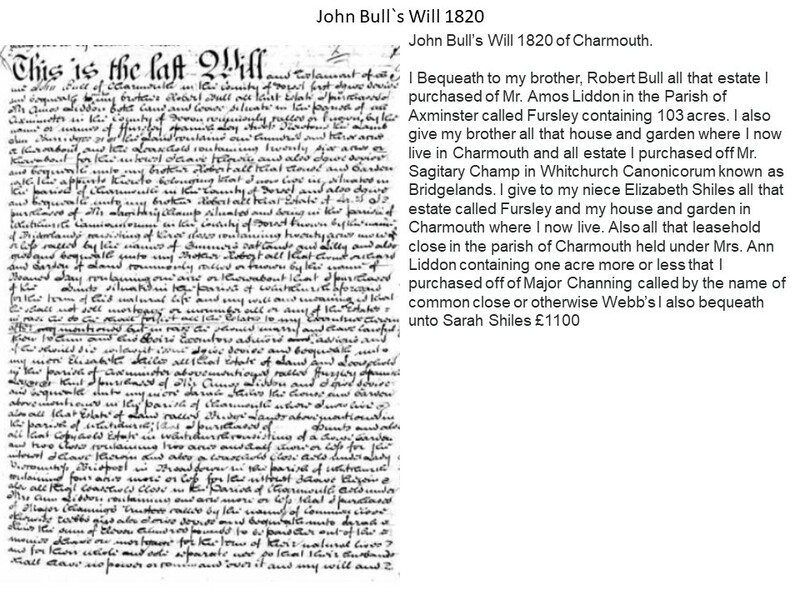 1751 William Walter to Samuel Burrow, Farrier (Blacksmith), who with his brother had bought a number of properties in the village. 1758 Samuel Burrow sold it to Walter Oke of Pinney who in turn sold it to Matthew Palmer of Plymouth. 1758 In the same year it went from Samuel Palmer to his sister Mary Palmer. 1770 Miss Palmer sold it to John Adcock of London for £105. 1771John Adcock rents it to Hurst Timberlake. 1784 John Adcock sell it to Lucius Bragge of Axminster. 1788John Bragge - Late Adcocks – Samuel Taunton esq (previously in Chideock. 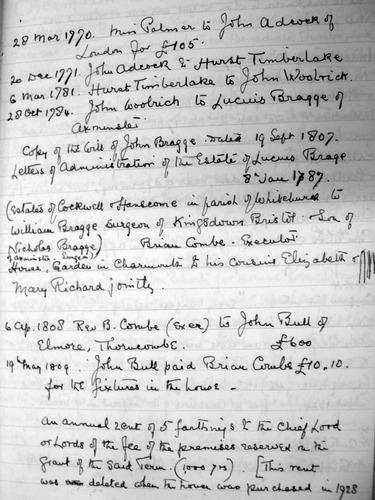 1807 - Will of John Bragge, Brian Coombe , Executor. House, Garden in Charmouth to his cousins Elizabeth and Mary Richard jointly. 1809 John Bull paid Brian Coombe £10 for the fixtures in the house. 1820 - " I give to my niece Elizabeth Shiles all that estate of Lands and Leaseholds in the parish of Axminster called Furzley that I purchased of Mr. Amos Liddon and I give unto her the house and garden in the parish of Charmouth I now live in also all that estate of Land called Bridge Lands in the Larish of Whitchurch .... 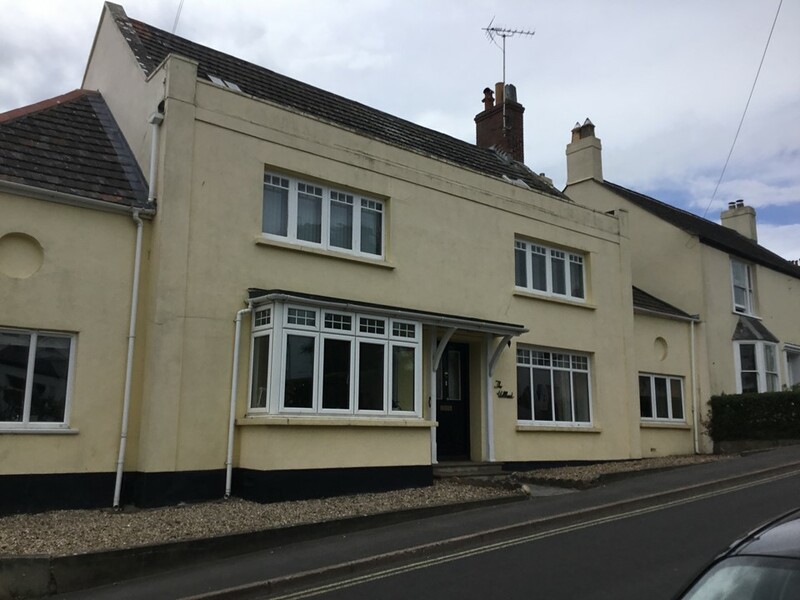 I also give the leasehold close in Charmouth held under Mrs. Ann Liddon containing one acre that I purchased of Major Channings trustees called by the name of Common Close otherwise Webb’s and also bequeathe unto Sarah Shiles the sum of £1100." 1820 – Henry Shiles renting the house to Griffiths. 1841 shows the house as unoccupied and being owned by Elizabeth & Sarah Shiles. It is described as House & Garden-1 rood 31perches. 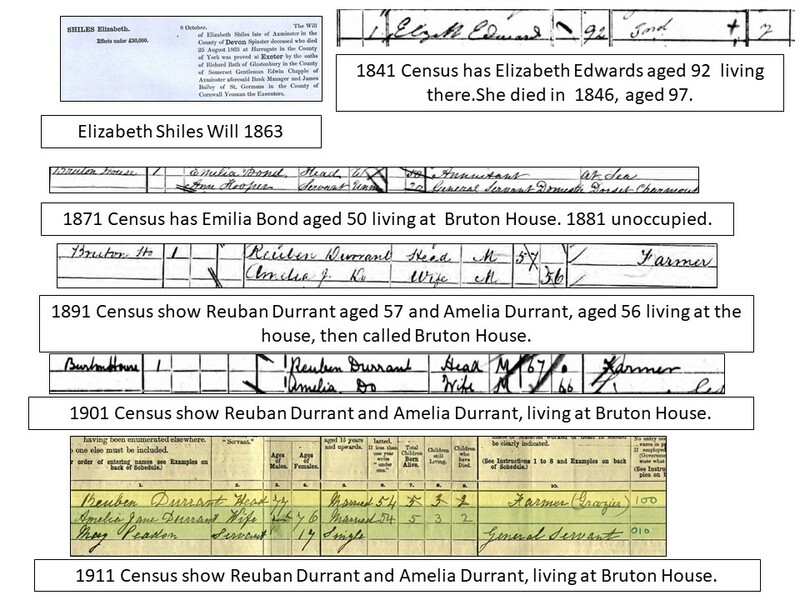 The Census has a Elizabeth Edwards renting it soon after. She is aged 93 and lives on for another 4 years. 1863 - Elizabeth Shiles dies. 1871 Emilia Bond ;iving at Bruton House. 1881 Census shows it unoccupied. 1891 Reuban Durrant who farms Wood Farm in Charmouth is living at Bruton House. 1901 Reuban Durrant is living at Bruton House. 1911 Reuban Durrant is living at Bruton House.